Quick-Lok Discs - ARC Abrasives, Inc.
Quick-Loks Discs are small discs (usually 2” or 3” diameter) with a button on the reverse side. The button allows the disc to be changed quickly with one twist and without the use of special tools. For this reason Quick-Lok Discs are often referred to quick change discs. This advantage of the button is reduced tool down time by quick and tool-less disc changeovers. 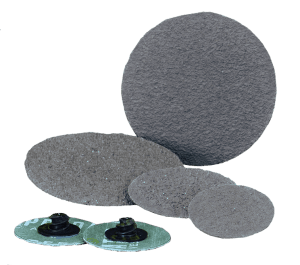 Quick-Lok discs are available in most coated and non woven abrasive backings. Smaller diameter discs typically do not last long, due to the small amount of abrasive grain able to fit within the product surface. The self-sharpening grains of PREDATOR™ quick-lok discs outlast many others, and the two grinding aids further increase life by keeping the material cool. Aggressive grinding with quick-lok discs is easily achieved due to the proprietary construction of PREDATOR™ materials. 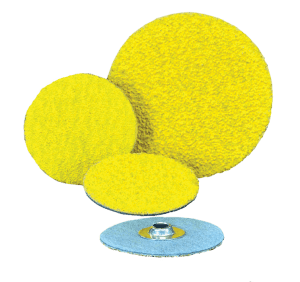 absorbing backing of resin fiber discs. Some flexibility is lost, but cut rates and product life are unsurpassed. From the high RPM of a quick-lok disc application, excessive heat can quickly load the disc material with aluminum or other soft metals. This may be common and unavoidable with conventional quick-lok discs, but Performance Coating alleviates heat from the grinding process. Lab results have shown Performance Coated quick-lok discs cut as much as ten times faster than untreated discs. The cluster, or agglomerate, that forms a compact grain is much different than conventional abrasives. Compact grains have multiple layers of the same grit – compared to only one layer of a conventional coated abrasive product. As an entire layer of abrasive grain is worn away, another layer is exposed. The compact grain construction results in less loading, longer life and a consistent finish. 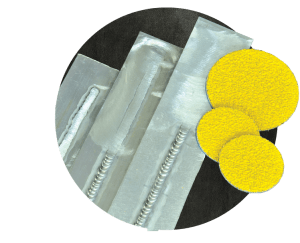 If you were to convert conventional coated abrasives to the same compact grain grit size, compact grains will appear much coarser than their conventional abrasive equivalent; but, they are no coarser than the grit stated on the backing. The unique manner in which compact grains wear away allow them to penetrate the hard structure of titanium and high nickel alloys, both very common materials for the aerospace industry. In finer grits, such as 80 and 120, compact grain quick-lok discs have shown three-to-one performance over conventional aluminum oxide and silicon carbide discs. The stacked grain structure contributes less heat to the grinding process and leads to a faster cut and better life.